Each month on the AYLIEN blog, we look into the previous month’s news to see what trends and insights we can extract using our News API. 2018 started with the news of a serious comedown from the highs of Bitcoin mania in December, and Donald Trump continuing to blaze a trail through American politics with new controversies. So last month was not exactly short of subject matter to dive into. Previously on the AYLIEN blog, we looked at the rising amount of stories being published about Bitcoin in November, and saw that the media coverage of Bitcoin was closely entwined with the cryptocurrency’s fortunes. This explains the huge number of people who bought into them and drove the price up, despite the relatively tiny number of people who understand cryptocurrency. So with the recent crash in the price of Bitcoin, we decided to look into whether the media had a role in the plummeting confidence of these same masses of people in Bitcoin’s prospects. How did the media’s publishing patterns relate to the price of Bitcoin? To look into the relationship between the media and Bitcoin, we compared the volume of stories published about Bitcoin with the daily closing price of Bitcoin (which we downloaded in CSV format from blockchain.info). We did this using the Time Series endpoint, requesting the daily volume of stories published with ‘Bitcoin’ in the title. You can see that the number of stories about Bitcoin skyrocketed on the day that the cryptocurrency crossed the $10,000 milestone. As its value continued to rise, the press interest remained (even rising a little), but after this initial infatuation, you can see that the only spikes in story volume occurred when Bitcoin lost value. When you look closely at the patterns of publication volume, you can see that after three news cycles of Bitcoin price rallies, the media were only interested in Bitcoin losing value. For example, notice how the price of Bitcoin increased by $2,000 in one day on January 5th, but this did not prompt any spike in press coverage. On the other hand, when Bitcoin lost value the following week, you can see two spikes in media interest. Using the Time Series endpoint like this lets us begin to extract insights into the press coverage without even looking at a single story. What were these stories talking about? Once we see the relationship between Bitcoin price and publishing volume spikes, we can see a definite correlation and guess that the media were interested in stories about the misfortune of Bitcoin investors. But using the News API, we can actually look into every one of these stories and analyze what was being written about at scale. To do this, we used the keywords parameter of the Trends endpoint to retrieve the most-mentioned people, places, and things from stories published in January with ‘Bitcoin’ in the title. After that, we converted the JSON returned by the News API into CSV format using this free, easy-to-use tool and visualized the file in Tableau. You can see from the chart that besides the obvious keywords like ‘blockchain’ and ‘currency,’ ‘South Korea’ and ‘volatility’ are two highly-prevalent keywords that cannot be explained away by a conceptual relation to Bitcoin. This means that the media had a big focus on South Korea’s clampdown on the cryptocurrency and its volatility in general. What content were people sharing about Bitcoin last month? Knowing that publishers were focused on the falling values of Bitcoin is great, as it gives us a hint about what narrative the media was pushing around it. But we can also take a look at what people were sharing on social media, which can give us an insight into what aspects of the saga the public were most interested in. Looking at the most-shared stories on Facebook, you can see that people were most interested in stories about government clampdowns on the cryptocurrency and its bad fortune in general. This shows that there was a popular appetite for the negative coverage. “Bitcoin prices fall as South Korea says ban still an option,” The Associated Press. 55,046 shares. “France wants tougher rules on bitcoin to avoid criminal use,” The Associated Press. 54,963 shares. “Facebook is banning all ads promoting cryptocurrencies — including bitcoin and ICOs,” recode. 18,384 shares. In terms of news coverage, there’s really no getting away from Donald Trump. For better or worse, the media is fixated on the President and January was no different. Last month, the President of the United States referred to Haiti and the countries of Africa as “shitholes” during talks on immigration reform, took a test used to diagnose dementia, and gave a speech to world leaders at Davos. We decided to see which stories the press were most interested in by using the Stories endpoint again. From the peaks in publishing volume about Trump, you can see that the most interest in the President on the day after the “shitholes” comment, followed by his speeches at Davos and the State of the Union, on the last day of the month. What sentiment did the media show towards each event? So we can see the events that prompted media coverage of the President in January. But with the News API, we can look into the sentiment of the coverage of each event. This gives us an insight into how people felt about the events influencing the news cycle. To do this, we use the Time Series endpoint and searched for the daily volume of stories with ‘Trump’ in the title, with queries for positive, negative, and neutral sentiment polarities in the story body. Below you can see the difference between the overwhelmingly negative sentiment in the coverage around the time of the “shithole” controversy, whereas the more balanced coverage on January 31st, the day Trump made his State of the Union speech. Knowing what events the media published most about is great, but we can go further and see exactly what stories people read and shared the most. “Trump attacks protections for immigrants from ‘shithole’ countries in Oval Office meeting,” Washington Post. 872,383 shares. “Trump referred to Haiti and African countries as ‘shithole’ nations,” NBC News. 396,978 shares. “Trump, Defending His Mental Fitness, Says He’s a ‘Very Stable Genius’’” The New York Times. 277,664 shares. 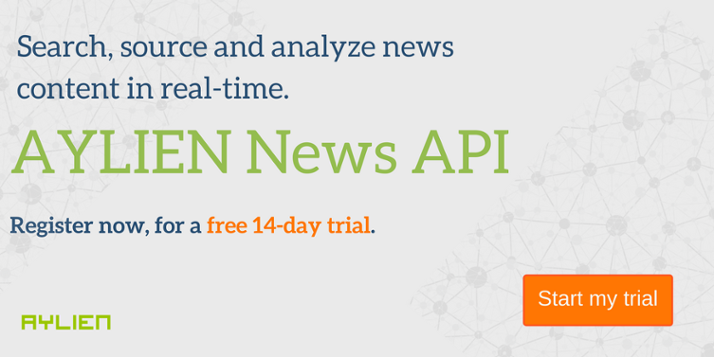 These are just two topics that interested us last month, but with the vast amount of enriched content that the News API gives you access to, you can dive into any topic, popular or niche, and start generating insights. Sign up for your free trial below and dive in! A Classics graduate from UCD, Will handles Inbound Marketing here at AYLIEN. Before joining us, Will completed a Master’s in Digital Humanities at Trinity College, where he used NLP methods to index where Latin terms appear in English Literature.